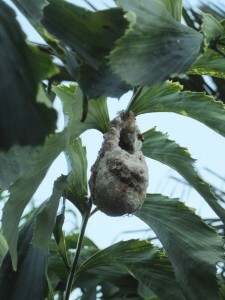 Mistletoe bird nest. LD photo. Peering up at a palm as we were enjoying a meal one night on my daughter’s back deck we noticed this strange blob suspended some distance above our heads. We could come to no conclusions in the dark but daytime observations showed it to be the carefully and solidly constructed nest of the tiny mistletoe bird. One bird book calls it a “baby’s bootee” nest and you can see why. According to the Birds in Backyards site the nest, which is entirely the work of the female, is made from matted plant-down and spider web, suspended from an outer branch (or in this case a palm frond). And while its form may be pear-shaped, it looks sturdy enough for that fate to be avoided by eggs and nestlings. Well done, Mum! Once I was home again with access to the Australian Museum website I discovered it was – wait for it! 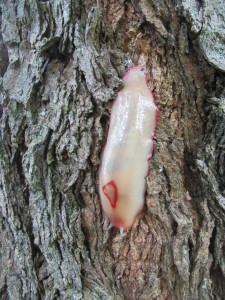 – the Red Triangle slug (Triboniophorus graeffei), the largest of Australia’s native land slugs. The red triangle encloses the animal’s breathing pore – which caused me to wonder, yet again, at the mysteries and marvels of evolution. The slugs come in a variety of colours including grey, yellow, olive green, pink and scarlet. 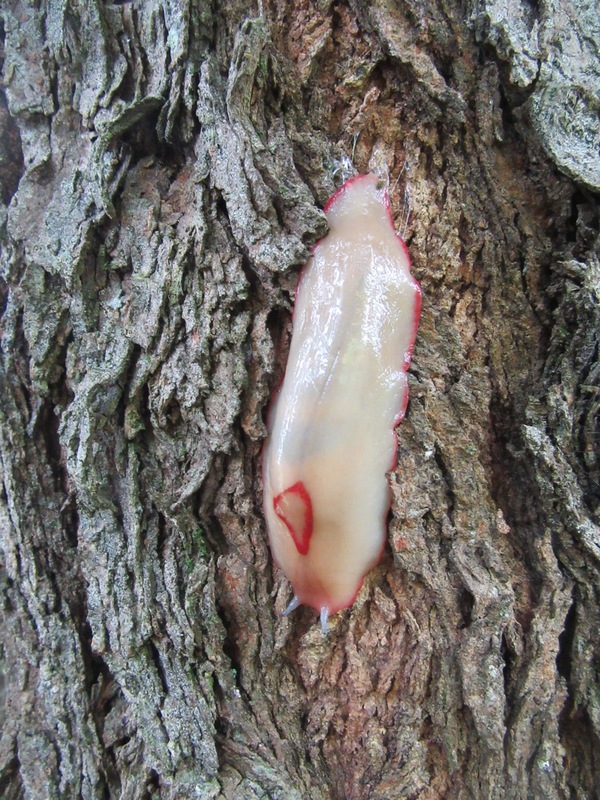 One source says that they graze on algae growing on the smooth bark of eucalypts (the one at left, slithering over the rough bark of an acacia, might have been doing some kind of penance) and have been known to enter bathrooms to feed on mould. They are found along the south-east Queensland and NSW coastal strip with some records in Victoria and an intriguing blue dot on the Atlas of Australia website which appears to be plonked on top of Townsville. Did someone import one for bathroom cleaning duties? PS Click on each photo to enlarge.